The popularity of Downton Abbey has surely increased the number of wanna-be upstairs dwellers (or wanna be downstairs dwellers) who visit the aristocratic mansions of wealthy Americans who lived during the same time period. My appreciation for the Biltmore historic château, home of the famed Vanderbilt dynasty, would not be nearly as great if I had not been tutored by BBC/PBS in the lifestyles of the rich and famous in the early 1900s. “This is where the valet assisted in the dressing. . .” whispered the audio tour in my ear. The valet (the ‘t’ must be pronounced). I know all about the valet and his duties. By the way Mr. Bates, how did you manage to have that monster killed? I was so excited, as if I had done my homework and had insider information going through the tour. My mind would wander to grand dinner parties, high fashion, culinary masterpieces created with rudimentary tools and. . . my two-year-old began to climb the bannister and my audio tour was abruptly over. The mansion can be toured at your own pace (or the pace of your toddler) with the assistance of an extensive audio tour. I caught snippets here and there. Little P enjoyed her personal listening device and quickly learned how to guide herself by pushing the correct numbers, as annotated on the placards in each room. Occasionally she would tell me what she was learning. “There was a big dog,” or, “the mommy died” – random facts a four-year-old would pick up on. Aside from recalling Downton Abbey drama, we came away with numerous decorating ideas for our new home. Dark wood panelling in the library. Proliferous glamorous, collectible art. 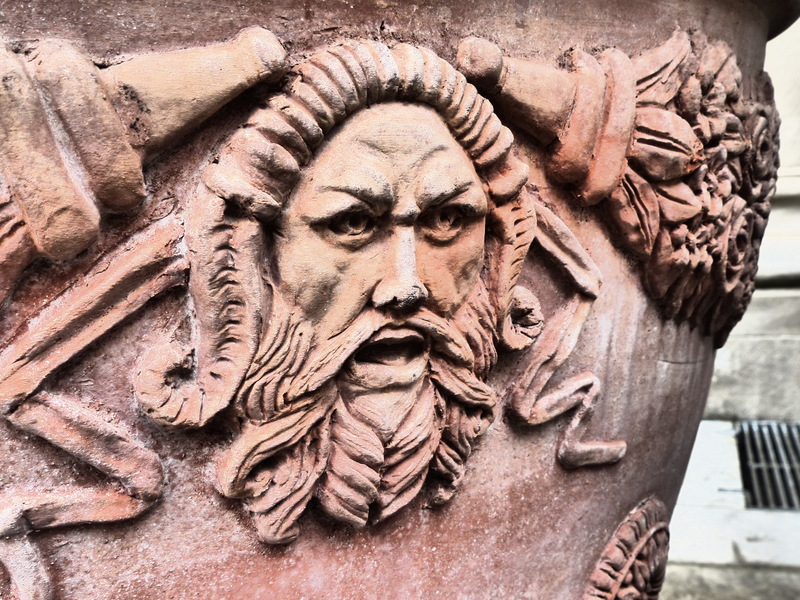 Terracotta planters the size of a shower stall. It was truly inspiring, though we don’t quite have the house staff or the income to keep up appearances. A tour of the home and the grounds, an all day event, satiated any desire we had to taste luxury. There was enough here to keep us and the kids busy all day, making our own memories. In the end, those memories will be more luxurious than faux memories of picnics on the lawn of Downton Abbey. 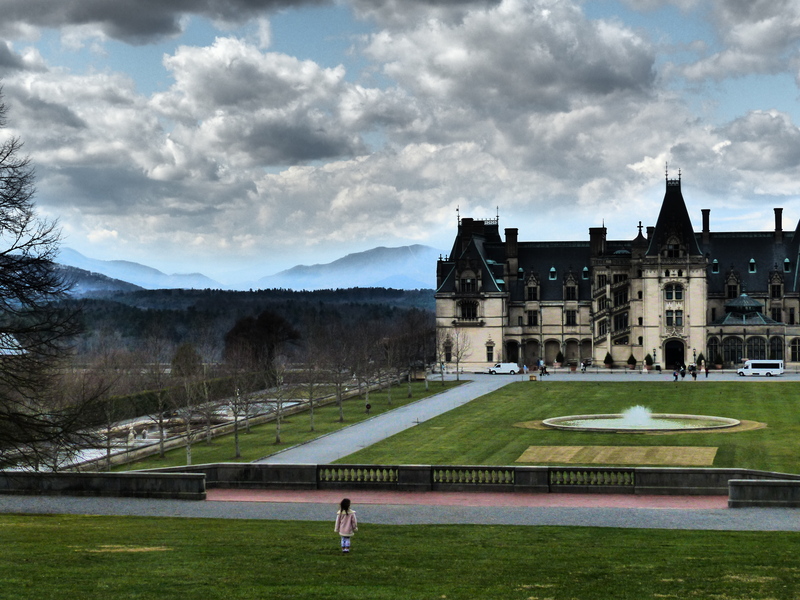 ************************************************************************************************************************************************ Even non-Downton Abbey viewers can appreciate the Biltmore Estate and grounds. 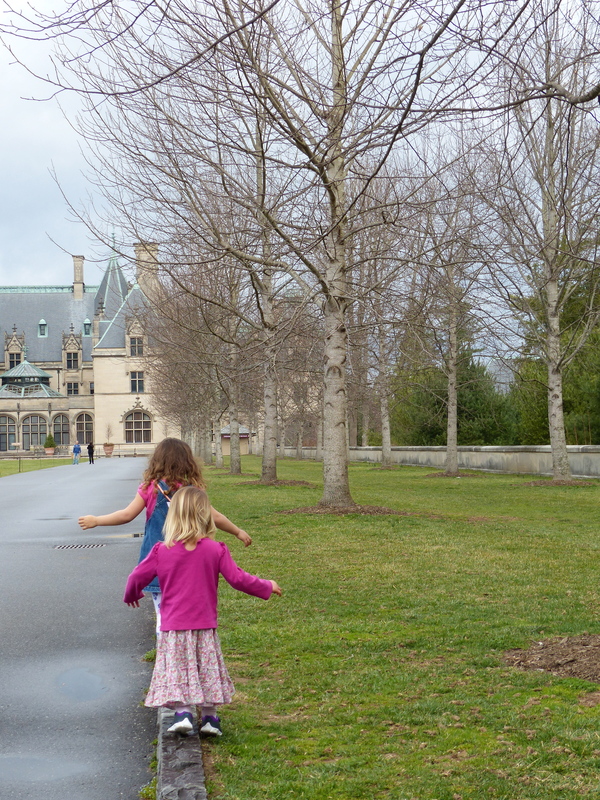 The Biltmore website contains exhaustive information about planning your visit and also includes photos of the mansion’s interior (visitors are prohibited from taking photos inside). Interested in more Downton Abbey musings? You can find out how Matthew Crawley eats (or should I say ate) an egg here or find out more about one of Martha Levinson’s favorite vacation spots here. This was one of my all time favorite places to visit and inspired me to start looking for other “house tours” wherever we traveled. I have also enjoyed the Rockefeller home (now Bassett Hall) in colonial Williamsburg, the Hearst Castle in California and many other homes of the rich and famous. Any time you get to see how the “other half” lives with permission to snoop around is great fun to me!